Chromatin immunoprecipitations were performed with cross-linked chromatin from 4 x 106 HCT 116 cells and Tri-Methyl-Histone H3 (Lys4) (C42D8) Rabbit mAb #9751, using SimpleChIP® Plus Enzymatic Chromatin IP Kit (Magnetic Beads) #9005. DNA Libraries were prepared from 50 ng, 5 ng, or 0.5 ng enriched ChIP DNA or 50 ng Input DNA using SimpleChIP® ChIP-seq Multiplex Oligos for Illumina® (Dual Index Primers) #47538, pooled into one sample, and sequenced on an Illumina® Next-Seq platform. The figure shows binding across GAPDH, a known target gene of H3K4me3. For additional ChIP-seq tracks, please download the product data sheet. Chromatin immunoprecipitations were performed with cross-linked chromatin from 4 x 106 HCT 116 cells and TCF4/TCF7L2 (C48H11) Rabbit mAb #2569, using SimpleChIP® Plus Enzymatic Chromatin IP Kit (Magnetic Beads) #9005. DNA Libraries were prepared from 50 ng, 5 ng, or 0.5 ng enriched ChIP DNA or 50 ng Input DNA using SimpleChIP® ChIP-seq Multiplex Oligos for Illumina® (Dual Index Primers) #47538, pooled into one sample, and sequenced on an Illumina® Next-Seq platform. The figure shows binding across CaMK2D, a known target gene of TCF4/TCF7L2. For additional ChIP-seq tracks, please download the product data sheet. Metagene analysis of ChIP-seq data generated using different amounts of starting ChIP DNA. Analyses of both Tri-Methyl-Histone H3 (Lys4) (C42D8) Rabbit mAb #9751 (left) and TCF4/TCF7L2 (C48H11) Rabbit mAb #2569 (right) ChIP-seq data show that the signal-to-noise ratio for peaks identified across entire genome are similar for all three starting amounts of ChIP DNA. Next generation sequencing (NG-seq) is a high throughput method that can be used downstream of chromatin immunoprecipitation (ChIP) assays to identify and quantify target DNA enrichment across the entire genome. The SimpleChIP® ChIP-seq DNA Library Prep Kit for Illumina® contains all of the enzymes and buffers necessary to generate high quality DNA sequencing libraries from ChIP DNA for next-generation sequencing on the Illumina® platform. The fast, user-friendly workflow minimizes hands-on time needed for generation and purification of DNA libraries. Each kit component must pass rigorous quality control standards, and for each new lot the entire set of reagents is functionally validated together by construction and sequencing of indexed libraries on the Illumina® sequencing platform. This product must be used in combination with SimpleChIP® ChIP-seq Multiplex Oligos for Illumina® (Single Index Primers) #29580 or SimpleChIP® ChIP-seq Multiplex Oligos for Illumina® (Dual Index Primers) #47538. This product provides sufficient amounts of reagents for 24 reactions and is compatible with both enzymatic- and sonication-fragmented, ChIP-enriched DNA. Note: Agarose beads are blocked with sonicated salmon sperm DNA, which will contaminate DNA library preps and NG-seq. When performing ChIP-seq, it is necessary to generate a control DNA sequencing library that can be used to determine any experimental bias in DNA enrichment that is introduced during the ChIP assay and DNA library preparation. DNA purified from input chromatin (i.e. the chromatin that was used for the IP) is typically used to generate the control DNA library. Starting Material: 500 pg –1 μg of ChIP DNA. To ensure optimal diversity of the DNA sequencing libraries, we recommend using 5 ng of ChIP-enriched DNA for transcription factor or co-factor ChIP-seq, 50 ng of ChIP-enriched DNA for total histone or histone modification ChIP-seq, and 50 ng of input DNA for the control DNA sequencing library. If necessary, less than 5 ng of ChIP-enriched DNA can be used for library generation; however, this may result in a lower diversity of library due to PCR bias during amplification. Thaw End Prep Enzyme Mix (•) at room temperature. Prepare 1X TE (10 mM Tris-HCl, pH 8.0, 1 mM EDTA). Prepare 0.5-50 ng of ChIP DNA and relative input DNA (control DNA) in a sterile nuclease-free tube. Add 1X TE to generate a final volume of 50 μl for each DNA sample. Add 3 μl of End Prep Enzyme Mix (•) and 7 μl of End Prep Reaction Buffer (•) to each DNA sample to make a total reaction volume of 60 μl. Thoroughly mix the reactions by pipetting up and down at least 10 times and perform a quick spin to collect all liquid from the sides of the tube. The presence of a small amount of bubbles will not interfere with performance. Proceed to Adaptor Ligation (Section II). If necessary, samples can be stored at -20°C; however, a slight loss in yield (~20%) may be observed. We recommend continuing with adaptor ligation before stopping. Both Adaptor for Illumina® (•) and USER™ enzyme (•) can be found in either SimpleChIP® ChIP-seq Multiplex Oligos for Illumina® (Single Index Primers) #29580 or SimpleChIP® ChIP-seq Multiplex Oligos for Illumina® (Dual Index Primers) #47538. Thaw Adaptor for Illumina® (•) at room temperature. Mix the Ligation Master Mix by pipetting up and down several times. Prepare approximately 2.5 μl of 10 mM Tris-HCl (pH 8.0-8.5) for each sample. Dilute the Adaptor for Illumina® (•) in 10 mM Tris-HCl (pH 8.0-8.5). If starting DNA is 5 ng to 100 ng, dilute the adaptor 1:10 to generate a working concentration of 1.5 mM. If starting DNA is less than 5 ng, dilute the adaptor 1:25 to generate a working concentration of 0.6 mM. Add 30 μl Ligation Master Mix (•), 1 μl Ligation Enhancer (•), and 2.5 μl diluted Adaptor for Illumina® directly to the 60 μl End Prep Reaction Mixture from step 5 in Section I. Note: Preparing a reaction premix containing the diluted adaptor ahead of time is NOT recommended. Thoroughly mix the ligation reaction by pipetting up and down at least 10 times and perform a quick spin to collect all liquid from the sides of the tube. The Ligation Master Mix is very viscous. Care should be taken to ensure adequate mixing of the ligation reaction, as incomplete mixing will result in reduced ligation efficiency. The presence of a small amount of bubbles will not interfere with performance. Add 3 μl of USER™ Enzyme (•) to the ligation mixture. Mix well and incubate at 37°C for 15 minutes with the heated lid set to ≥ 47°C. Proceed to Cleanup of Adaptor-ligated ChIP DNA (Section III). (Safe Stop) Alternatively, samples can be stored overnight at -20°C. Size selection is NOT recommended during the Cleanup Adaptor-ligated ChIP DNA phase, because it results in a dramatic decrease in both yield and diversity of ChIP-seq DNA libraries. If using AMPure® XP beads, allow the beads to warm to room temperature for at least 30 minutes before use. Vortex AMPure® XP Beads or SPRIselect® beads to resuspend. Prepare 400 μl of 80% ethanol for each sample. Prepare 17 μl of 10 mM Tris-HCl (pH 8.0-8.5) for each sample. Add 87 μl (0.9X) resuspended AMPure® XP beads or SPRIselect® beads to each adaptor ligation reaction. Mix well by pipetting up and down at least 10 times. Be careful to expel all of the liquid out of the tip during the last mix. Incubate samples on bench top for at least 5 minutes at room temperature. Place the tube/plate on an appropriate magnetic stand for 5 minutes to separate the beads from the supernatant. Once the solution is clear, carefully remove and discard the supernatant. Be careful not to disturb the beads that contain DNA targets. Add 200 μl of 80% freshly prepared ethanol to the tube/plate while in the magnetic stand. Incubate at room temperature for 30 seconds, and then carefully remove and discard the supernatant. Be careful not to disturb the beads that contain DNA targets. Repeat step 5 once for a total of two washes. Be sure to remove all visible liquid after the second wash.
Air dry the beads for up to 5 minutes while the tube/plate is on the magnetic stand with the lid open. Note: Do not over-dry the beads. This may result in lower recovery of DNA targets. Elute the samples when the beads are still glossy looking, but when all visible liquid has evaporated. When the beads start to crack, they are too dry. Remove the tube/plate from the magnetic stand. Elute the DNA target from the beads by adding 17 μl of 10 mM Tris-HCl (pH 8.0-8.5) per sample. Mix well by pipetting up and down 10 times. Incubate for at least 2 minutes at room temperature. Place the tube/plate on the magnetic stand and wait for 5 minutes. Once the solution is clear, transfer 15 μl of supernatant containing the DNA targets to a new PCR tube. Proceed to PCR Enrichment of Adaptor-ligated ChIP-DNA (Section IV). (Safe Stop) Alternatively, samples can be stored at -20°C. Universal PCR Primer for Illumina® (•) and twelve Index Primers for Illumina® (•) are provided in SimpleChIP® ChIP-seq Multiplex Oligos for Illumina® (Single Index Primers) #29580. For use with Single Index Primers (#29580), use only one Index Primer per PCR reaction. Refer to #29580 data sheet for valid barcode combinations and tips for setting up PCR reactions. Eight Index 5 Primers for Illumina® (white caps) and twelve Index 7 Primers for Illumina® (orange caps) are provided in SimpleChIP® ChIP-seq Multiplex Oligos for Illumina® (Dual Index Primers) #47538. For use with Dual Index Primers (#47538), use only one Index 5 primer and one Index 7 primer per reaction. Refer to #47538 data sheet for valid barcode combinations and tips for setting up PCR reactions. Thaw primers and the purified adaptor-ligated ChIP DNA fragments (from step 9, Section III) at room temperature. Thoroughly mix the reaction by pipetting up and down 10 times and perform a quick spin to collect all liquid from the sides of the tube. For starting material of 50 ng ChIP DNA, repeat steps b and c for a total of 6 cycles. For starting material of 5 ng ChIP DNA, repeat steps b and c for a total of 10 cycles. For starting material of 0.5 ng ChIP DNA, repeat steps b and c for a total of 13 cycles. Proceed to Cleanup of PCR Amplification (Section V). (Safe Stop) Alternatively, samples can be stored at -20°C. Prepare approximately 40 μl of 10 mM Tris-HCl (pH 8.0-8.5) for each sample. Add 45 μl (0.9X) resuspended AMPure® XP beads or SPRIselect® beads to 50 μl PCR reaction from step 4 in Section IV. Mix well by pipetting up and down at least 10 times. Be careful to expel all of the liquid out of the tip during the last mix. Carefully remove and discard the supernatant. Be careful not to disturb the beads that contain DNA targets. Remove the tube/plate from the magnetic stand. Elute the DNA target from the beads by adding 33 μl of 10 mM Tris-HCl (pH 8.0-8.5) per sample. Mix well by pipetting up and down 10 times. Incubate for at least 2 minutes at room temperature. Place the tube/plate on the magnetic stand and wait for 5 minutes. Carefully transfer 30 μl of supernatant containing the DNA targets to a new tube. (Safe Stop) Libraries can be stored at -20°C. Measure the concentration of library DNA by Nanodrop or Picogreen assay. The concentration of the DNA library should be in the range of 10-40 ng/μl. Dilute 1 μl of the library DNA with 10mM Tris-HCl to a final concentration of 5-10 ng/μl. Use the diluted library DNA to determine size distribution using an Agilent Bioanalyzer® High Sensitivity DNA chip, according to the manufacturer’s instructions. Dilute final purified library samples with 10mM Tris-HCl for high throughput sequencing. Refer to Illumina® sequencing manual for optimal concentration and volume of library DNA required for NG-seq. Figure 1. 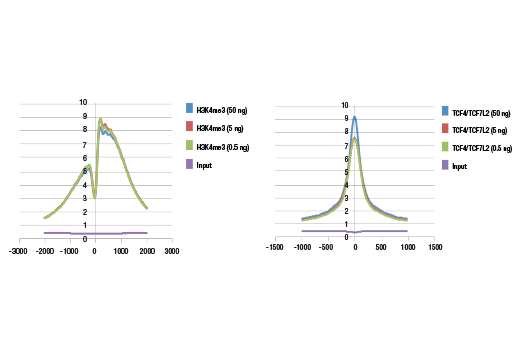 Agilent Bioanalyzer® profiles of DNA libraries prepared from different starting amounts of ChIP DNA generated using the SimpleChIP® Plus Enzymatic Chromatin IP Kit (Magnetic Beads) #9005. DNA libraries were prepared from 50 ng, 5 ng, and 0.5 ng of enriched ChIP DNA and 50 ng input DNA. As shown, each DNA library preparation shows a similar DNA fragment size (expected range 300 bp to 900 bp). Table 1. Comparison of DNA sequencing libraries prepared from different starting amounts of ChIP DNA generated using the SimpleChIP® Plus Enzymatic Chromatin IP Kit (Magnetic Beads) #9005. ChIP was performed using 4 x 106 HCT 116 cells and either TCF4/TCF7L2 (C48H11) Rabbit mAb #2569 or Tri-Methyl-Histone H3 (Lys4) (C42D8) Rabbit mAb #9751. Libraries were generated using dual index primers provided in SimpleChIP® ChIP-seq Multiplex Oligos for Illumina® (Dual Index Primers) #47538, pooled into one sample, and sequenced on an Illumina® Next-Seq platform. As shown, the number of identified peaks is similar for all three starting amounts of ChIP DNA. Figure 2. ChIP-seq data generated using Tri-Methyl-Histone H3 (Lys4) (C42D8) Rabbit mAb #9751 and different starting amount of ChIP DNA, as described in Table 1. The figure shows binding across chromosome 12 (upper panel), including GAPDH (lower panel), a known target gene of H3K4me3. As shown, both peak patterns and peak heights are similar for all three starting amounts of ChIP DNA. Figure 3. 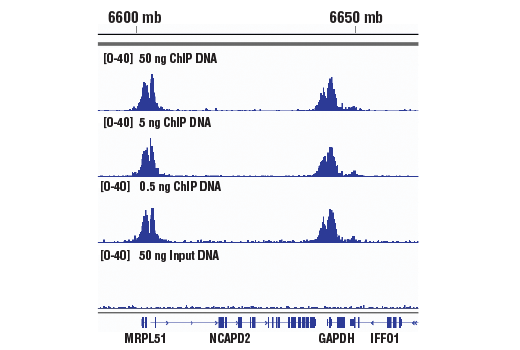 ChIP-seq data generated using TCF4/TCF7L2 (C48H11) Rabbit mAb #2569, as described in Table 1. 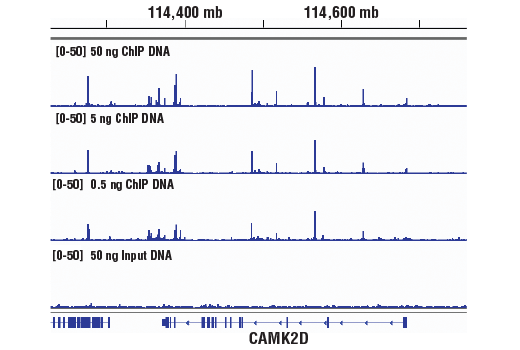 The figure shows binding across chromosome 4 (upper panel), including CaMK2D (lower panel), a known target gene of TCF4/TCF7L2. As shown, both peak patterns and peak heights are similar for all three starting amounts of ChIP DNA. Figure 4. Metagene analysis of ChIP-seq data generated using different amounts of starting ChIP DNA. Analyses of both Tri-Methyl-Histone H3 (Lys4) (C42D8) Rabbit mAb #9751 (left panel) and TCF4/TCF7L2 (C48H11) Rabbit mAb #2569 (right panel) ChIP-seq data show that the signal to noise ratio for peaks identified across entire genome are similar for all three starting amounts of ChIP DNA. End Prep Enzyme Mix is optimized to convert 500 pg-1 μg of fragmented DNA to repaired DNA having 5´-phosphorylated, 3´-dA-tailed ends. SDS-PAGE Purity: SDS-PAGE analysis of each individual enzyme indicates > 95% enzyme purity. Endonuclease Activity: Incubation of a minimum of 10 μl of this enzyme mix with 1 μg of φX174 RF I DNA in assay buffer for 4 hours at 37°C in 50 μl reactions results in less than 10% conversion to RF II as determined by agarose gel electrophoresis. Phosphatase Activity: Incubation of a minimum of 10 μl of this enzyme mix in protein phosphatase assay buffer (1 M diethanolamine @ pH 9.8 and 0.5 mM MgCl2) containing 2.5 mM p-nitrophenyl phosphate at 37°C for 4 hours yields no detectable p-nitrophenylene anion as determined by spectrophotometric analysis at 405 nm. Functional Activity (Nucleotide Incorporation, Phosphorylation and dA-Tailing): 1 μl of this enzyme mix repairs and phosphorylates the ends of > 95% of 0.5ug of DNA fragments containing both 3´ and 5´ overhangs with 20 minutes at 25°C, in 1X End Repair Reaction buffer, as determined by capillary electrophoresis. 16-Hour Incubation: 50 μl reactions containing this reaction buffer at 1X concentration and 1 μg of HindIII digested Lambda DNA incubated for 16 hours at 37°C results in no detectable non-specific nuclease degradation as determined by agarose gel electrophoresis. 50 μl reactions containing this reaction buffer at 1X concentration and 1 μg T3 DNA incubated for 16 hours at 37°C also results in no detectable non-specific nuclease degradation as determined by agarose gel electrophoresis. Endonuclease Activity: Incubation of this reaction buffer at a 1X concentration with 1 μg of φX174 RF I DNA for 4 hours at 37°C in 50 μl reactions results in less than 10% conversion to RF II as determined by agarose gel electrophoresis. RNase Activity: Incubation of this reaction buffer at 1X concentration with 40 ng of a FAM-labeled RNA transcript for 16 hours at 37°C results in no detectable RNase activity as determined by polyacrylamide gel electrophoresis. Phosphatase Activity: Incubation of this reaction buffer at a 1X concentration in protein phosphatase assay buffer (1 M diethanolamine @ pH 9.8 and 0.5 mM MgCl2 ) containing 2.5 mM p-nitrophenyl phosphate at 37°C for 4 hours yields no detectable p-nitrophenylene anion as determined by spectrophotometric analysis at 405 nm. Ligation Master Mix is a ready-to-use solution of T4 DNA Ligase, proprietary ligation enhancer, and optimized reaction buffer. 16-Hour Incubation: 50 μl reactions containing Ligation Master Mix at 1X concentration and 1 μg of HindIII digested Lambda DNA incubated for 16 hours at 37°C results in no detectable non-specific nuclease degradation as determined by agarose gel electrophoresis. 50 μl reactions containing Ligation Master Mix at 1X concentration and 1 μg T3 DNA incubated for 16 hours at 37°C also results in no detectable non-specific nuclease degradation as determined by agarose gel electrophoresis. Endonuclease Activity: Incubation of Ligation Master Mix at a 1X concentration with 1 μg of φX174 RF I DNA for 4 hours at 37°C in 50 μl reactions results in less than 10% conversion to RF II as determined by agarose gel electrophoresis. RNase Activity: Incubation of Ligation Master Mix at 1X concentration with 40 ng of a FAM-labeled RNA transcript for 16 hours at 37°C results in no detectable RNase activity as determined by polyacrylamide gel electrophoresis. 16-Hour Incubation: 50 μl reactions containing 1 μl Ligation Enhancer and 1 μg of HindIII digested Lambda DNA incubated for 16 hours at 37°C results in no detectable non-specific nuclease degradation as determined by agarose gel electrophoresis. 50 μl reactions containing 1 μl NEBNext 5´ SR Adaptor 3 and 1 μg of T3 DNA incubated for 16 hours at 37°C results in no detectable non-specific nuclease degradation as determined by agarose gel electrophoresis. Endonuclease Activity: Incubation of a 50 μl reaction containing 1 μl Ligation Enhancer with 1 μg of φX174 RF I supercoiled DNA for 4 hours at 37°C results in less than 10% conversion to RF II (nicked molecules) as determined by agarose gel electrophoresis. RNase Activity: Incubation of a 10 μl reaction containing 1 μl Ligation Enhancer with 40 ng of RNA transcript for 16 hours at 37°C resulted in no detectable degradation of RNA as determined by gel electrophoresis. Phosphatase Activity: Incubation of 1 μl Ligation Enhancer in protein phosphatase assay buffer (1 M diethanolamine @ pH 9.8 and 0.5 mM MgCl2 ) containing 2.5 mM p-nitrophenyl phosphate at 37°C for 4 hours yields no detectable p-nitrophenylene anion as determined by spectrophotometric analysis at 405 nm. The Q5® PCR Master Mix (2X) is specifically optimized for robust, high fidelity amplification of next-generation sequencing (NGS) libraries, regardless of GC content. The polymerase component of the master mix, Q5 High-Fidelity DNA Polymerase, is a novel thermostable DNA polymerase that possesses 3´→5´ exonuclease activity, and is fused to a processivity-enhancing Sso7d domain. Q5 also has an ultra-low error rate (> 100-fold lower than that of Taq DNA Polymerase and ~12-fold lower than that of Pyrococcus furiosus (Pfu) DNA Polymerase). The buffer component of the master mix has been optimized for robust amplification, even with GC-rich amplicons and offers enhanced compatibility with a variety of beads used in typical NGS workflows. These features make the Q5® PCR Master Mix ideal for NGS library construction. This convenient 2X master mix contains dNTPs, Mg++ and a proprietary buffer, and requires only the addition of primers and DNA template for robust amplification. The inclusion of the hot start aptamer allows convenient room temperature reaction set up. 16-Hour Incubation: A 50 μl reaction containing Q5® PCR Master Mix and 1 μg of HindIII digested λ DNA incubated for 16 hours at 37°C results in no detectable non-specific nuclease degradation as determined by agarose gel electrophoresis. 50 μl reactions containing Q5® PCR Master Mix and 1 μg of T3 DNA incubated for 16 hours at 37°C results in no detectable non-specific nuclease degradation as determined by agarose gel electrophoresis. Phosphatase Activity: Incubation of Q5® PCR Master Mix in protein phosphatase assay buffer (1 M diethanolamine @ pH 9.8 and 0.5 mM MgCl2 ) containing 2.5 mM p-nitrophenyl phosphate at 37°C for 4 hours yields no detectable p-nitrophenylene anion as determined by spectrophotometric analysis at 405 nm. Functional Activity (Multiplex PCR, Bead Inhibition): 30 cycles of PCR amplification of 20 ng genomic DNA with and without carboxylated magnetic beads in a 50 μl reaction containing 0.5 μM 4-plex primer mix and 1X Q5® PCR Master Mix result in the four expected amplicons and no inhibition of amplification in the presence of the beads. Next generation sequencing (NG-seq) is a high throughput method that can be used downstream of chromatin immunoprecipitation (ChIP) assays to identify and quantify target DNA enrichment across the entire genome. The SimpleChIP® ChIP-seq DNA Library Prep Kit for Illumina® contains all of the enzymes and buffers necessary to generate high quality DNA sequencing libraries from ChIP DNA for next-generation sequencing on the Illumina® platform. The fast, user-friendly workflow minimizes hands-on time needed for generation and purification of DNA libraries. This product must be used in combination with SimpleChIP® ChIP-seq Multiplex Oligos for Illumina® (Single Index Primers) #29580 or SimpleChIP® ChIP-seq Multiplex Oligos for Illumina® (Dual Index Primers) #47538. This product provides sufficient amounts of reagents for 24 reactions and is compatible with both enzymatic- and sonication-fragmented, ChIP-enriched DNA. This product is compatible with SimpleChIP® Enzymatic Chromatin IP Kit (Magnetic Beads) #9003, SimpleChIP® Plus Enzymatic Chromatin IP Kit (Magnetic Beads) #9005, and SimpleChIP® Plus Sonication Chromatin IP Kit #56383. This product is not compatible with SimpleChIP® Enzymatic Chromatin IP Kit (Agarose Beads) #9002 and SimpleChIP® Plus Enzymatic Chromatin IP Kit (Agarose Beads) #9004 because agarose beads are blocked with sonicated salmon sperm DNA, which will contaminate DNA library preps and NG-seq. This kit has been validated in combination with SimpleChIP® ChIP-seq Multiplex Oligos for Illumina® (Single Index Primers) #29580 or SimpleChIP® ChIP-seq Multiplex Oligos for Illumina® (Dual Index Primers) #47538 to generate qualified DNA libraries using 50 ng, 5 ng, or 0.5 ng ChIP DNA as starting materials. Libraries prepared from different starting amounts of ChIP DNA exhibit similar Bioanalyzer® profiles, genome mapping rates, numbers of identified binding peaks, and signal-to-noise ratios across the whole genome. AMPure is a registered trademark of Beckman Coulter, Inc.
SPRIselect is a registered trademark of Beckman Coulter, Inc. USER Enzyme is a registered trademark of New England Biolabs, Inc.